The Xume 77mm Lens Adapter and Filter Holder Pro Kit from B&H includes two lens adapters and four filter holders to provide quick and easy attachment and removal of four different filters on two separate lenses. The Xume Lens Adapter and Filter Holder system revolves around both filters and lens' filter rings receiving precision-machined metal rings and then utilizing NdFeB rare Earth magnets to facilitate a secure, but easy to remove, connection between the filter and lens. By using a magnetized, non-threaded connection, the chance of cross-threading or jamming filters onto the lens is eliminated and time is saved when swapping filters. The Xume 77mm Lens Adapter is a precision-machined metal ring that attaches to a lens with a 77mm-diameter filter thread to provide instant and secure attachment of filters when Xume Filter Holders are installed. 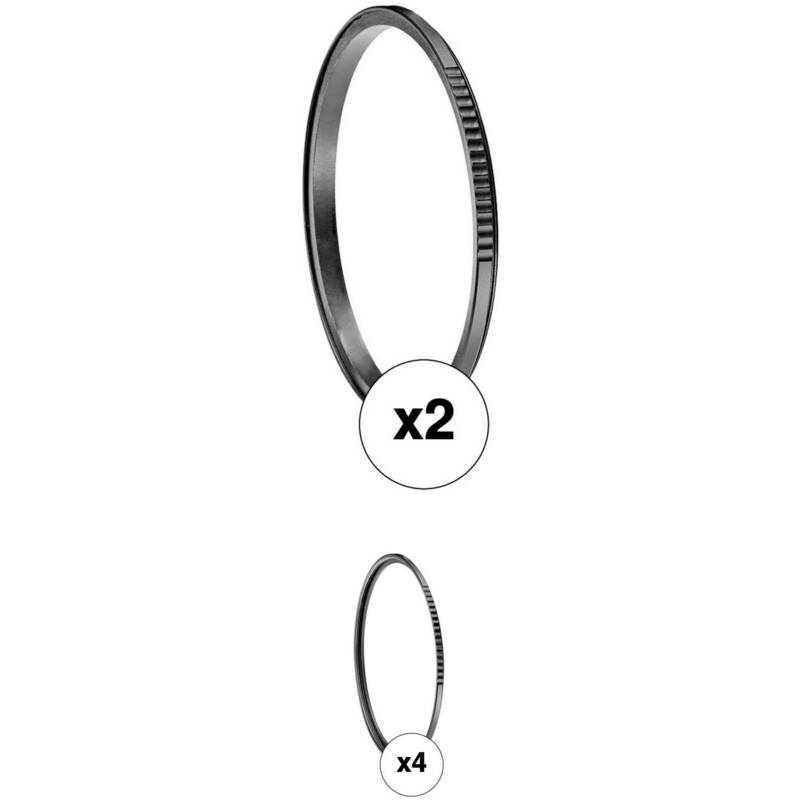 This adapter ring incorporates NdFeB rare Earth magnets into its design to enable a strong, but easy to remove, connection between the lens adapter and filter holder. By using quick-to-remove magnets to attach filters, changing of filters can occur much more quickly and eliminates the chance of cross-threading or jamming when installing or removing filters. The ring is approximately the same thickness as most step-rings and will not cause vignetting on most lenses with focal lengths as wide as 24mm (35mm equivalent). 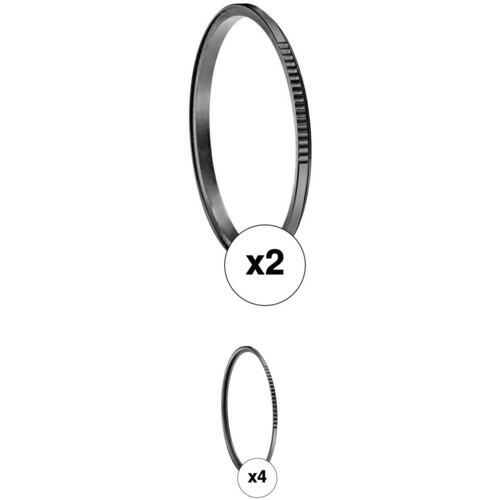 Over-the-lens type lens hoods are still compatible when Xume Adapters and Holders are in place and are recommended during use to provide an even more assured connection if working in busy environments. The Xume 77mm Filter Holder is a precision-machined metal ring that attaches to a 77mm circular screw-in filter to provide instant and secure attachment to lenses when a Xume Lens Adapter is installed. NdFeB rare Earth magnets are integrated within lens adapters to attach to the filter holder to and provide a strong, but easy to remove, connection that is suitable for use with oft-used filters. By using quick-to-remove magnets to attach filters, changing of filters can occur much more quickly and eliminates the chance of cross-threading or jamming when installing or removing filters. The ring is approximately the same thickness as most step-rings and will not cause vignetting on most lenses with focal lengths as wide as 24mm (35mm equivalent). Over-the-lens type lens hoods are still compatible when Xume Adapters and Holders are in place and are recommended during use to provide an even more assured connection if working in busy environments. 77mm Lens Adapter and Filter Holder Pro Kit is rated 4.1 out of 5 by 12. Rated 5 out of 5 by TEH from Second order This is my second order and second review of this product. These are used to assist in making a quick change of filters. Today, I realized that there is a second benefit. I almost always get a finger print on the lens or the filter while trying to screw a filter onto a lens. This is faster and less prone to getting fingers on filter and/or lens. I did run into one small problem with my 11mm-16mm lens. The lens has a vignetting problem at 11mm and 12mm so the extra 5.8mm is a problem. My 77mm 35-year-old Mamiya polarizer adds another 9.1mm while my new B-W SX-Pro Digital only adds 4.16mm. Filter choice with the rings is critical when it come to vignetting with some lenses. Rated 4 out of 5 by John P. from Useful but not perfect These adapter do what they are supposed to do; allow for quick use of filters. The down side is they they vignette very badly. I was told that they would but didn't realize to what extent. When they are used on a 24-120 lens I can't shoot wider that 50mm even without a filter. So the adapter ring is only put on the lens when I know I am going to be using filters. Best thing to do would be to buy a size larger than you need. In the case of the 24-120 I would need 82mm filters and adapters. At the cost of quality ND filters that is no an option for me. I would only recommend this item with the caveat they larger filters are used. Rated 5 out of 5 by Mike Femia from Eliminates a needless distraction! Attaching and removing various filters was previously a distraction, and using the XUME has been a huge convenience for me. I do video documentary work with a converted SLR.Especially when run and gun, I'm constantly between buildings, vehicles, and harsh sun, and frequently need variable/graduated NDs.NOTE: your lens cap will not clip on to the female XUME (Lens Adapter), because the lip is too shallow. For a single lens/filter/cap application, I use: 1 Lens Adapter, and 2 Filter Holders: one for a lens cap, and one for a filter. All in all, I still give the XUME 5-stars because it does exactly what it's supposed to do: let me focus more on my subject and create value, instead of fidgeting, looking like a doofus, cross-threading a filter, sometimes dozens of times a day. Rated 1 out of 5 by Ana from Disappointed When I first heard of the Xume adapter I thought it was a very clever idea. However, I was not lucky with Xume; perhaps the set I bought was defective. After using it for a couple of times, my UV filter fell off the lens. I think one of the holder layers got stuck on the lens adapter for some reason; the filter would not get attached to it again.Somehow, the magnet was not working. But the worse part is that the holder got stuck to the filter, I simply could not unscrew it; even took it back to B and H and one one the salesperson tried to help me unscrew it to no avail. I ended up buying a new UV filter;and was relieved the Xume adapter did not get stuck to my lens. Rated 3 out of 5 by Ryan from Shadows lead me to think I should have gone bigger Overall, I like the concept and convenience, but depending on the lens, you might get what looks like vignetting - but is really just the rings being visible at the edges. Not good. So I will have to take care which lenses I use them on. In fact, you could probably solve the issue simply by using a step-up ring, like I'm doing with my smaller lenses. I had decided to get just once size of filter, to match my largest diameter lenses. What I think I should have done is get the largest set of these available (82mm???) and step up even my largest lenses to use them. Rated 5 out of 5 by Raafi from As advertised, it's a snap! The first time my filter clicked onto the lens with the same reassuring snap as in their promotional video, my heart jumped. It feels like magic. I've only had it out on set for a few days, but it's already proved exceedingly useful as I use a variable ND and several prime lenses. You can imagine how many times I was screwing and unscrewing that filter a day. Or shooting at minuscule f-stops when I didn't want to be bothered. This product solves that conundrum, with a snap. One thing -- I ended up having to buy more lens adapters because it's one filter that I needed to put on multiple lenses, and not several filters that I needed for one or two lenses. That said, the product still gets five stars because it works as advertise and makes my job easier. Rated 5 out of 5 by jad from Just What I've Been Waiting For This product is awesome! It does exactly what it says it will do and the magnets hold very nicely. I am going to get it for all my lens because I have missed so many shots because I couldn't get the filter on the lens fast enough. Now with Xume no more missed shots while working with the filters. Yes there can be some vignetting when you use wide angle but it doesn't bother me all that much. IS it possible to mix 77 and 72 mm adapter and holder in this kit offer? Sorry no we are not able to do that. Will the 77mm Holder Kit hold the 82mm step up ring and 82mm Variable ND filter? Asked by: Nic Cha K.
This clever and useful accessory is not designed for what you are asking. I am sure you would be at high risk of the filter falling off. Is it safe to assume the adapter works with non-Manfrotto filters? Yes they do, I use them with Sing filters. They also work with rubber lens hoods. Assuming I'd need to get screw in lens hoods for use with this product and add their adapter? Or, is there another solution? I hold my hand or hat to block the front element.